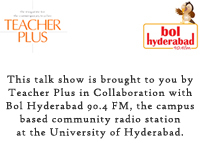 Teaching and Learning Moments with Teacher Plus is a programme on education and various aspects of teaching and learning in and outside the classroom. With new episodes every week and different guest speakers coming in and sharing their experiences and points of view, we plan to bring you discussions and answer your questions on practices in education. Write in to editorial@teacherplus.org with your questions. As we continue our talk with award winning film maker and theatre director K.M. Chaitanya, we learn how active and enthusiastic teachers manage to bring out the best in their students. Chaitanya talks about how his teachers in college and university and later the directors he worked with pushed him to achieve things he never thought he could. Like his teachers, Chaitanya says with his students (assistant directors) he engages in such a way that they learn to become independent and come to believe in themselves and their work. K.M. Chaitanya, film maker and theatre director is the artist for this week on Teaching and Learning Moments. Through this interview Chaitanya takes us on this fascinating ride of his life of growing up among academicians and theatre experts to changing course to learn math and science and then coming back and finding himself in theatre. Episode 9: How would you like to learn art? This week we feature Polish visual artist Anna Okrasko. In this interview Anna describes her journey as a student of art, an artist, and a ‘non regular’ teacher of art. Having been a student in a very traditional and in many ways restrictive school of art in native Warsaw and then moving on to a more liberal and open-minded school in the Netherlands, Anna believes that art is an expression of the individual self and it is up to the individual to find his/her path to learn art. No teacher can teach art, a teacher can only guide. Have you discovered your passion yet? Do passions remain with you? Does your identity spring from your passion? Can you ever be free of the expectations and restrictions that an identity forces on you? Find answers to these questions as you listen to our final episode with documentary filmmaker and singer, Shabnam Virmani. Shabnam shares with listeners how she began singing and what impact that has had on her as a person, how it has made connect with herself and with others. Shabnam also talks about the different identities that she has worn so far (of a feminist, a filmmaker and now a singer) and how she now believes she is free of them. The episode is interspersed with two folk songs sung beautifully by Shabnam. We continue our discussion with documentary filmmaker Shabnam Virmani. In this episode Shabnam reveals the learnings she has gained from her quest to understand this mystic poet—Kabir. Who is a guru? How important is the guru outside and what role does the guru within us play? What are social issues? Are sloganeering and protests the only way of engaging with these problems? How relevant is Kabir in these very troubled social times? These are some of the questions that Shabnam attempts to answer. Shabnam Virmani is our guest on Teaching and Learning Moments this week. Shabnam is a documentary filmmaker and artist in residence at the Srishti School of Art, Design and Technology in Bangalore. Co-founder of the Drishti Media Arts and Human Rights collective, she has directed several documentaries in close partnership with grassroots women’s groups in the country, some of which have won awards. Shabnam conceived and directed the highly acclaimed Kabir Project which brings together the experiences of a series of journeys in quest of Kabir, the 15th century mystic poet in our contemporary worlds. From a B.com graduate to becoming a journalist and finally a filmmaker, Shabnam talks of the very confusing and yet in the end a fulfilling journey she has had so far. Even as a filmmaker her journey to find herself continued as she moved from the social world to the spiritual. In this second part of the interview with journalist turned writer, Amandeep Sandhu, Aman talks in length of the few teachers that have made a lasting impression on him and teachers that have made him what he is today. Aman believes that good teachers are those that don’t blindly follow process but provoke their students to think, ask questions, and help open their eyes. To encourage more of such teachers to flourish and help the children of this country learn and grow, it is high time that we addressed the several faults in our education system. In this week’s Teaching and Learning Moments we talk to Amandeep Sandhu, writer based in Bangalore. Before settling down to be a writer, Aman has worked as a farm-hand, woollen-garment seller, shop assistant, tuition master, teacher, and journalist. Aman has published two works of fiction Sepia Leaves and Roll of Honour. Aman is now working on a non-fiction book on Punjab, Punjab- Journeys through fault lines. In this first of the two part interview Aman talks about how his childhood and the circumstances he grew up in contributed to his current profession—that of being a writer. From his own experience of being in boarding schools and Army run schools, Aman also discusses how important it is to be kind and accepting as a teacher, how a teacher should create the environment to learn. We continue to talk to artist and Sahitya Akademi Award winner Ravi Kumar Kashi this week. In part two of the interview, Kashi talks about the damage that the current education system has caused on the creativity and originality of students and how he as a teacher constantly invents new ways of teaching art to overcome this problem and bring back the sense of exploration and curiosity in students. This episode features Ravi Kumari Kashi—painter, sculptor, photographer and installation artist. His work explores everyday themes such as desire, gratification and consumerism. Kashi is also a Sahitya Akademi Award winner. He writes in Kannada and English. Kashi talks about his beginnings as an artist and how being a teacher of art has helped him grow both as a person and as an artist. While Season 1 of the show had educationists discussing solutions to the various problems that teachers face in their classrooms, in Season 2 we feature artists who talk about the major influences of teachers/mentors in their lives and the unique perspective that they bring to their students. Season 2 begins (this month) with an interview of Faisal Abu Alhayjaa, a Palestenian theatre artiste. Faisal Abu Alhayjaa speaks about his journey with Freedom Theatre, the lessons he learnt from his mentors, and how working with children has healed him. As teachers we have a lot to learn from what Faisal has to say.